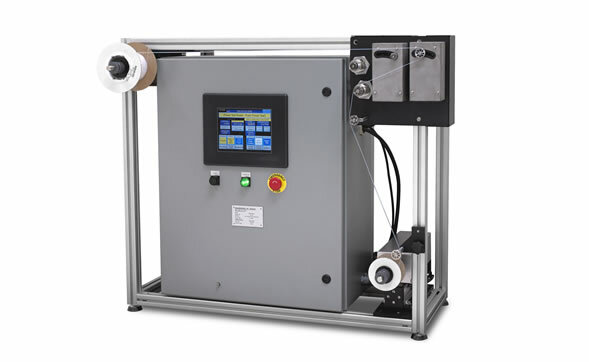 Bulk filament arrives on large spools, while production equipment uses smaller spools. 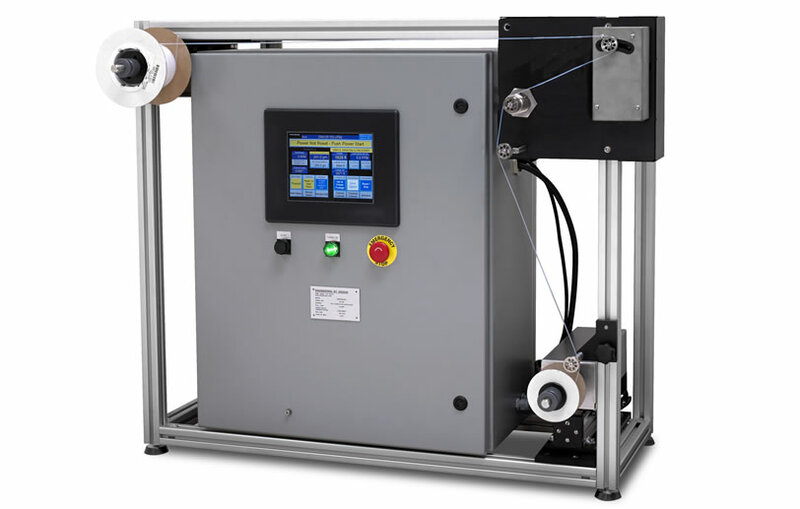 The respooling operation is needed to transfer the filament, with best production results made when the respooling is done at a controlled tension level. The operator selects a recipe from a set of 10 recipe files. Each file contains the variables used by the respooler. The payoff spool is driven by a servo motor. The payoff controls the tension by using a control loop to keep the dancer centered during motion. Line speed is added to the payoff’s speed control during winding. Two versions are available. A single tension version or for a larger tension range, a Dual tension version. On dual tension models, the tension setpoint determines which sensor is selected for use. If the tension setpoint is above the calibration load setting for the low tension sensor, the high tension sensor is used for control. The tension is controlled by a spring connected to the dancer arm. A small stepper motor adjusts the tension on the spring in response to the filament squeezing a load cell transducer. The filament passes down through pulleys to a takeup spool. The takeup spool is driven by a second servo motor, generally as a fixed speed. The takeup spool is mounted on a linear slide called the traverse. A second stepper motor moves the takeup spool back and forth under the incoming pulley to provide an even distribution of the filament.